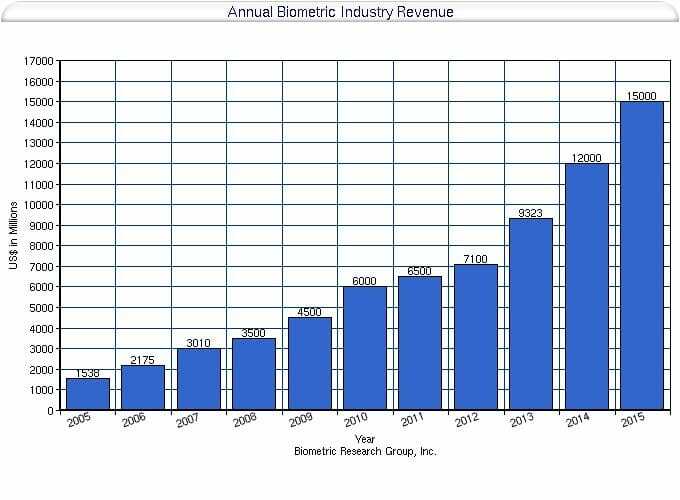 Biometrics Research Group Inc. projects that the global biometrics market will grow to $15 billion by 2015 from its 2012 estimated value of $7 billion. The market for automated fingerprint identification systems and fingerprint biometric technologies account for the greatest share of the global biometrics market and is forecast to continue to be the main source of overall market revenues from 2010 to 2015. 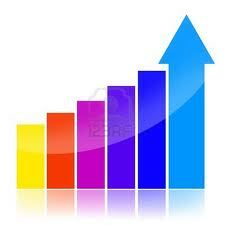 This sector is valued at $5 billion in 2012 and is expected to reach nearly $10 billion in 2015. Face, iris, vein, and voice recognition biometric technologies together form the second largest segment. This sector is worth an estimated $2 billion in 2010 and is expected to reach $5 billion in 2015. Biometrics Research Group views the commercial market as a huge “greenfield” opportunity. Large organizations often must issue multiple passwords, ID cards, tokens, and other forms of identification or authentication for employees. Such systems create the enormous task of managing the additions, cancellations, and database storage of these identifiers. Biometric solutions can streamline an organization’s security system by eliminating the need for multiple identifiers, as the user’s authentication is tied to physical characteristics. Financial services, healthcare, and e-commerce are primary areas of commercial opportunity for biometric product and service providers. As for corporate spending on implementing biometric technologies, we expect that will remain slow in the near-term. The costs of biometric systems remain a major deterrent to adoption for corporations. Due to the economic downturn worldwide, enterprises have been reducing their expenditures and have been limiting budgets allocated to both IT and corporate security. With multinational companies curtailing their spending, large-scale, time-consuming deployment of biometric technologies within the enterprise have been deferred or discouraged. Despite the popular perception that the security industry is one of the most recession resilient industries worldwide, capable of providing a positive rate of return to an economy’s GDP, the global biometrics market ironically did weaken during the economic crisis between 2007 and 2009, due to the steady deterioration of the worldwide business climate. A key factor identified to have triggered the decline included the collapse of the construction industry, especially new office, commercial and residential building projects, which reduced new installations of biometrics-based access control equipment in buildings and commercial spaces. Postponement and delays in government infrastructure projects, and cost cutting among commercial establishments, and companies also played instrumental roles in negatively impacting new equipment order influx rates. High levels of unemployment and pruning down of workforce, during this period, also softened corporate focus on biometrics based time and attendance, labor management and timekeeping solutions. Widespread postponements, cancellation of security projects and delays in scheduled system replacements in existing facilities, as a result of distortions in economic variables, such as, drying up of debt markets, lack of capital investments, deep corporate budgets cuts, resulted in declines in replacement demand. However, given the long duration of the previous recession, the slowdown in biometric market growth was mild. Average annual growth when viewed in isolation, was still a healthy, indicating that there were still a wide number of opportunities in this space in the form of increased crime rates and thereby increased incentive for investments in these technologies. For instance, recession-induced consumer loss of confidence in financial institutions, surging crime rates in most urban and private residential areas, shattered confidence in public safety agencies and law enforcement departments, all necessitated high-level security arrangements. Biometric Research Notes provides forward-looking and systematic data about the global biometric market, allowing industry stakeholders to calculate political, economic and investment risk.